I get more questions about my makeup and skincare then anything else on my Instagram, so if you have been wondering what my routines are here you go! I am no beauty professional, my skin is not perfect, I don't do peels and facials EVER like I probably should, I just try and take care of my skin as much as possible. I am blessed with pretty easy skin, but this has not always been the case! I have had sensitive skin all my life, had terrible rashes as a kid, awful eczema on my face and would react to anything. Thankfully I have outgrown most of that and thankfully only get an odd pimple once a month around that special time. I have tried so many products and love so many, but here is a roundup of my faves and what I use most of the time! Disclaimer: This is in no way sponsored by any brand, this is 100% my opinion and experience! Cleaning my face is one thing I have not found a go-to product for until just recently! So I remove my makeup first with makeup wipes, just generic ones from the grocery store are fine with me. 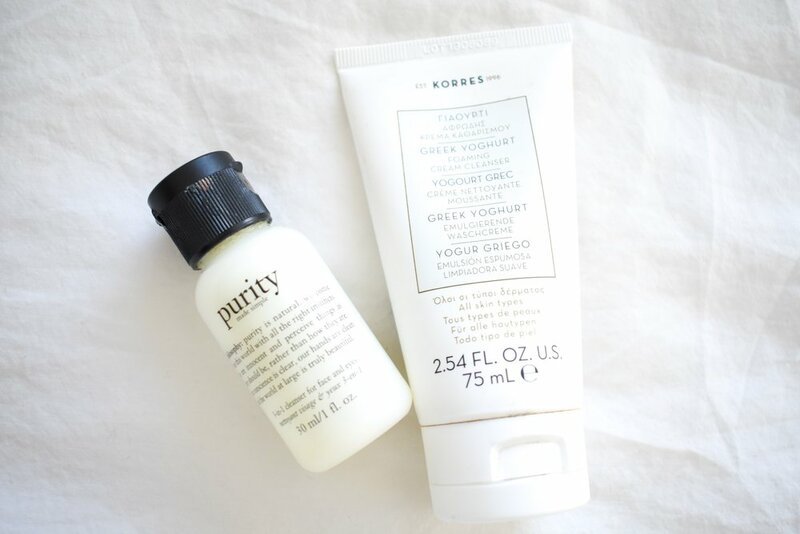 Once it is all removed, my go-to cleanser right now is the Philosophy Purity Made Simple Cleanser - it makes my face feel so clean and that there is nothing left on my face without stripping it dry. It may be a little pricier than a drugstore item, but when it comes to your face, I’d rather pay a few more dollars for a better product with better ingredients than going cheap. Now the KEY to skincare to me, which unfortunately is newer to my routine, is exfoliation! You can spend hundreds of dollars on good expensive skincare, but it's not going to do as well if you're applying it to a face with a ton of dead gross skin on it! I use my Michael Todd Soniclear Petite Antimicrobial Facial Skin Cleansing Brush at least twice a week and it makes all the difference. That is probably the one thing in this entire blog post to invest in if you just have to choose one. As another option, I am loving my Korres Greek Yoghurt Foaming Cream Cleanser - another amazing, lightweight, foolproof cleanser that leaves your face feeling fresh and clean. Eyes are another super tricky product to find. I was using the one from Mary Kay for a while… meh? It was ok. The one I have been using and stuck to more recently is the Rodan and Fields Multi-Function Eye Cream. I am sure you can find 100,000 people selling this brand everywhere, I feel like everyone is selling some sort of product these days! But this one is hydrating and I like my results! This is the only area I really have any sort of wrinkles and I am that person who is SO OBSESSED with not touching my face to prevent wrinkles! I am definitely open to trying different products to see if I find one that totally wows me, so leave a comment in the comment section below if you have found a must have under eye cream! Ok - so moisturizers are a tricky one for me. Finding a moisturizer that isn’t too heavy that it breaks you out is ROUGH. I have had some bad experiences for sure, some major breakouts, it's not fun trying to find a good moisturizer that work for your skin type. However a few months ago I found my new FAVOURITE night and day moisturizers that feel amazing on my skin and give so much hydration without being heavy or oily! It is th Korres Wild Rose Vitamin C Brightening 24H Moisturizer and Vitamin C Brightening Sleeping Facial. Okay - again, not sponsored, these are genuinely my FAVOURITES. I’ve learned that anything vitamin C is amazing on my skin, is a winning product and these blow any other product I’ve tried out of the water. So let's chat oils! I live in the dry wasteland of the prairies and my skin is so dry out here that any oil or serum I am on board with! I am OBSESSED with this Rose Sauvage Vitamin C Active Brightening Oil - I have linked here a package of all these items in one kit, just go buy this. Just add it to your cart and click here. If you follow me on Instagram and stay up with my stories, you’ll already know what is going to be in this section as my fave masks! Elizabeth Grant makes some incredible and hydrating masks that I have been using a ton over these last few weeks! Definitely check them out, I haven’t tried one that I haven’t loved yet. Other masks that I love are these Sephora brand masks! I have used these for a while and they are great! And I think that is it! I’m sure things will change as time goes on, but I am constantly getting compliments on my skin and I am trying to take care of it as much as I can as I am not getting any younger over here! Genetics, hydration and upkeep play a huge part in how your skin looks and helping it out with a few great products is the icing on the cake!